Violence is preventable, childhood violence, more so. This post is an attempt to review the role of social media campaigns in changing the profile and awareness amongst different audiences around violence pertaining to childhood. In addition, wherever possible, we have mapped the target audience and the kinds of impact that may be attributable to a campaign. The idea is not to study virality or popularity. Instead, our aim is to review advocacy initiatives that cover Violence Against Children, popularly known as #VAC in social media,and to assess how they may affect social change. That search has led us to reviewing UNICEF’s #EndViolence social media campaign and how it enshrines best practices. Before we dive deeper, let us look at what comprises Best Practice in Social Media. Launched in 2013, UNICEF’s #EndViolence social media campaign stands out as one of the most recognizable campaigns concerning the issue of violence against children. The primary Twitter account of UNICEF, @UNICEF, was the focus of this survey. Since its launch, the #EndViolence campaign has included video endorsements by celebrity ambassadors, specially commissioned music videos, reports, and infographics. The hashtag is regularly used by non-UNICEF accounts, including accounts with large numbers of followers such as other major international organizations and anti violence campaigns. The hashtag has been so popular on Twitter in many countries that it is now regularly used for issues not directly related to the UNICEF campaign or violence against children – including posts regarding violence against women and posts in response to violent events such as mass shootings and acts of terrorism. While the campaign has gained most attention in the English speaking world – with the vast majority of #EndViolence tweets being posted in the US and Canada, it is also widely used in Central and South America and in Asia. In terms of following the Best Practice guidelines, UNICEF’s #EndViolence campaign has consistently used a good mix of regular text tweets and tweets with attached images carrying text or data. On the days we measured, retweets made up 78% of the total number of tweets carrying the #EndViolence hashtag. In that same time period, #EndViolence tweets were appearing in the timelines of over 7.5 million Twitter users. On the days we measured activity, the @UNICEF account was posting an average of 24.24 tweets per day and over 85% of those tweets were being retweeted. Over 85% were also being ‘liked’. 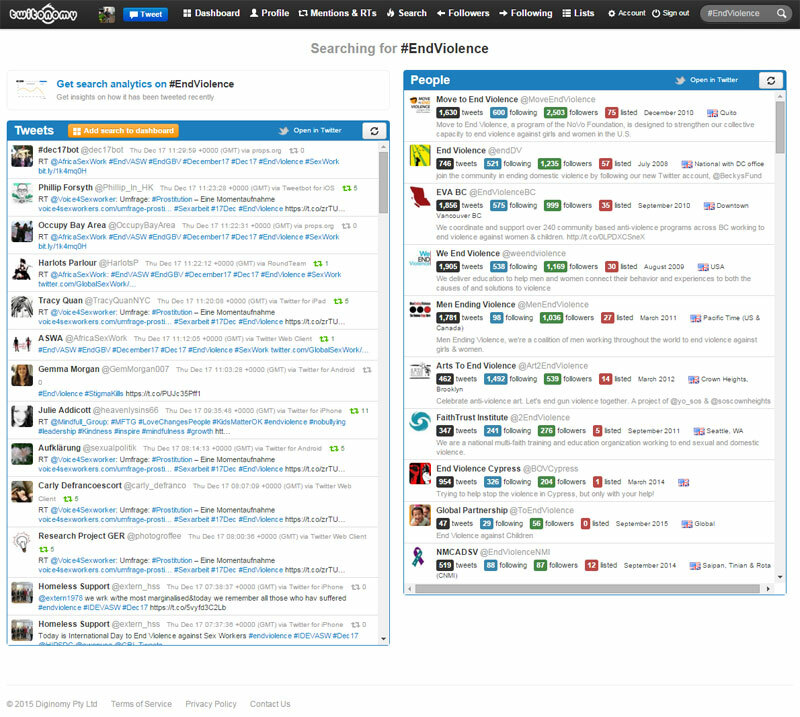 The account makes good use of hashtags with an average of 1.9 hashtags per tweet – indicating that the majority of tweets carried no more than two hashtags. The average number of links per tweet was .51 – indicating roughly every second tweet carried a link. The only Best Practice that does not seem to be common with @UNICEF is requesting retweets. Considering the number of followers (4.89 million) and the frequency with which the account receives retweets, it is unlikely that @UNICEF really needs to bother with such requests – and given that the account regularly uses all of the other best practices to great effect, it is safe to say that they are covering their bases sufficiently. 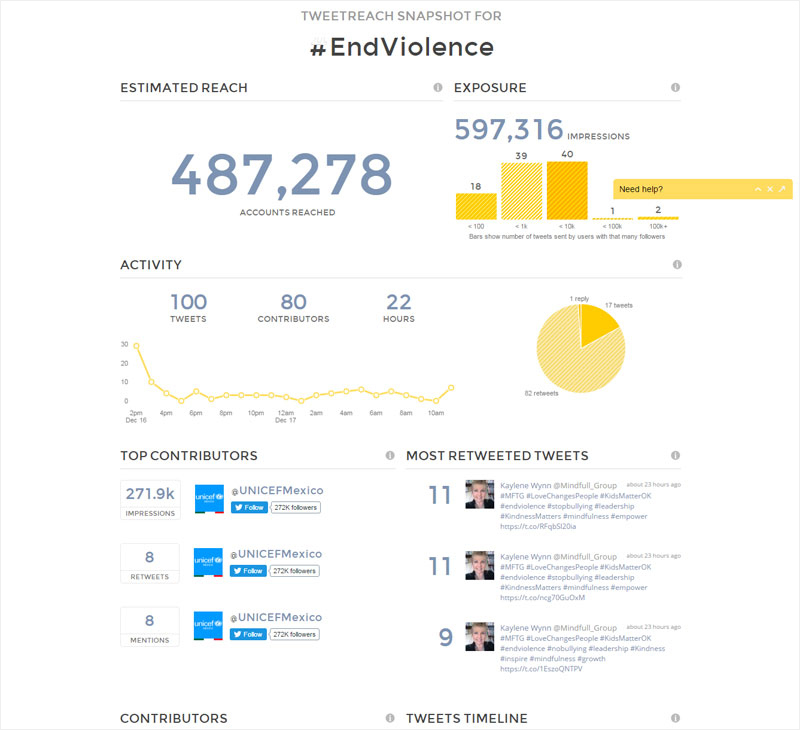 Our analysis of the #EndViolence campaign was conducted using a combination of the following, free-to-use online tools: TweetReach, Twitonomy, Keyhole, and Hootsuite’s analytic tools. The global recognition of the #EndViolence campaign suggests that this is a model for social media communication worth building on in efforts to bring Target 16.2 of the Sustainable Development Goals (SDG’s) to a wider audience. When Jeremey Shiffman and Stephanie Smith put forward their framework for how health issues become global political priorities, civil society and grassroots movements were cited as one of the main actors involved in pushing an idea forward. With this in mind, it seems natural that grassroots mobilization should be a key factor in ensuring governments around the world live up to their SDG commitments to children. The first step in ensuring that mobilization is effective public communication on the issue of violence against children, and the opportunities that the SDGs present. A social media campaign on Target 16.2 should ideally emulate the #EndViolence campaign in adhering to best practice in order to increase the chances for virality on social media. This would of course require careful planning and the dedication of resources to produce appropriate supporting media such as infographics and photographs, and videos and messages from celebrity champions. Like the #EndViolence campaign, a Target 16.2 campaign should also take advantage of related events such as the Universal Children’s Day and the International Day of the Girl Child to benefit from pre-existing attention on the subject. The success of the #EndViolence campaign in gaining online recognition shows that the means to reach a wide audience do exist and are accessible even with a relatively low (compared to a traditional advertising campaign) level of human and financial resources. A social media campaign of this kind, focused on Target 16.2, is certainly something that should be strongly considered by the field to be carried out in parallel to government level communications and advocacy efforts. With efforts already underway, wherein like-minded organizations and key players in the field of “child rights and child policy” such as UNICEF, Save The Children, Child Fund and others have come together as a response to Target 16.2 to form the “Global Partnership to End Violence Against Children”, a social media campaign will help amplify that voice. *This blog post is collaboration between guest blogger, Fabio Venturini, Communications and Advocacy Director at Without Violence, and Sudeshna Mukherjee, Communications Manager, Know Violence in Childhood. We invite other guest bloggers to contribute pieces relevant to violence in childhood.